New report showing solar pv almost an order of magnitude more expensive than bau. Hard to find where the “cheaper than utility” idea comes from. Hot water and cooking are already magically pulled out. Even if you pulled out the generator, take some sharp energy reduction measures (reduce to 2-3 kW), and made sharper assumptions on aircon you still aren’t close. Battery life is already generous, and future battery cost reductions are handled pretty well (especially considering the assumptions on lifetime). “Cheaper than utility” parrots, will keep on squawking, obviously. Yesterday Campbell Newman held a press conference and announced that the Queensland Government would today serve court documents on IBM regarding the billion dollar health payroll disaster. They filed the claim on 4th December last year, so unless they have it renewed they must serve it within a year – i.e. this week. I can’t see how they can sustain a claim against IBM since the Labor government signed away all rights against IBM. It will be fascinating to see how they frame their Claim. Being cynical, and given that the Claim had to be served this week anyway, this looks to me like an act of political desperation rather than an otherwise boring, mundane and un-noteworthy step in the commercial litigation process. Iain, can you name some “Cheaper than utility” parrots whom you say will obviously keep squawking on? I’d be interested to see who they are. If you can’t produce at least one name I’ll be terribly disapointed. On current ABC election predictions, it looks like Australian Cyclists party preferences may contribute to the Shooters and Fishers being elected to the Victorian Legislative Council in two regions in Victoria, in one case it seems directly at the expense of the Greens. This seems like one for John Quiggin’s category of Boneheaded Stupidity. It may work out differently in the event because in Victoria we now have the capacity to vote below the line in the LC by choosing only five candidates. I am not sure how many people took advantage of this, or whether it has been figured in to Antony Green’s calculator, but possibly it could make the chance of this sort of thing happening a bit less (I can only hope). In the interests of balance, I should add that the Greens preferenced PUP ahead of Labor in some regions. This stuff just has to stop, it is clearly undemocratic for parties to preference others whose policy positions are incompatible with their supporters’ presumable wishes in voting for them. It will be interesting to see how may people voted below the line in the LC, but I don’t think that in itself is going to solve the problem. Apparently Anthony Green had some kind of outburst about this sort of thing on the ABC on election night, I didn’t see it but I’m interested in what he said, if anyone else here saw it? Holy Toledo, Batman: airport siege and robbery in PNG. If this can happen at a major airport in PNG, it makes me redden with shame that Australia’s government(s) consider sending boat arrival refugees, and people of undetermined refugee status, to PNG for permanent residency is a decent thing to do. Uh oh, look’s like the BOM is in for some more efficiency dividends…for exceeding the spring average temperature (of 24C) by a whopping 1.5C. Snip snip. iain: Battery life is already generous, and future battery cost reductions are handled pretty well (especially considering the assumptions on lifetime). Also remarkably generous was the report’s assumption of *no price increase whatsoever* to the cost of grid electricity over the next 11 years. Bit strange when grid electricity prices have doubled in just the last 5-6 years. Also, iain, are you aware of how much it costs a developer to run utilities, and specifically electricity, through a new sub-division? To have all those hundreds of metres/kilometres worth of new power poles installed, trenches dug, cables laid etc? As the grid electrical company who commissioned the report – Endeavour Energy – actually services a lot of outer-suburban and regional greenfield development areas, can you explain why the report failed to include *any* of those costs? Clive Palmer gave an interesting address to the press club today. You wouldn’t know it if you get you’re information from the “press”. I watched it on ‘youtube’. He discussed a wide range of issues from refugees to the budget. The Guardian followed the 1% neo-con dictat and wrote an attack piece, or tried to, about how big fat mean Clive was being mean to the poor helpless honest scribes from News Ltd.
“All those papers are controlled by Rupert Murdoch. Your paper is owned by his personal family. You get directions from the editor, Rupert Murdoch. He gets on Skype in New York,” Palmer said, going on to accuse Murdoch of trying to control how Australians think. What an outrageous thing for big fat mean Clive to say! He also advocated RET, action on climate change and the need to keep coal in the ground. But we didn’t have time or brainspace to mention that – too busy attacking the guy who is a real threat to the ALP/LNP duopoly. Murdoch is a manipulative, exploitative capitalist. Clive Palmer is a manipulative, exploitative capitalist. They are no different. Clive Palmer makes money out of coal. If he wanted to he could keep all the coal he controls in the ground. Of course, he doesn’t do that. Don’t forget, Clive Palmer was part of the Nationals team in the Joh days. He was up to his eyeballs in the whole gerrymander, corruption of government, didgy deal, favours for the boys thing that was Joh and the Nash-a-nulls. Never trust LNP, Labor, any billionaire, any multi-millionaire, any merchant banker or any lawyer in parliament. You can be sure NONE of them are governing for ordinary workers. Oops, typo, that should be “dodgy deals”. “Dodgy deals done dirt cheap! I certainly won’t be trusting anyone who voted for the government’s winding back of the FoFA reforms especially the consumer protection aspects of it. Good on Jacqui Lambie and Ricky Muir for putting the interests of the community in front of the powerful financial institutions. I was very disappointed the PUP voted to pass the changes after big Clive (prior to the election) kept banging on about how powerful lobby groups were corrupting the political process. He was obviously referring to community lobby groups not corporate. Yes, many of the gov’s reforms made sense, but the consumer interests test was obviously not one such reform that needed any change. I was rather keen on AC/DC back in the 1970s … along with Deep Purple, Led Zeppelin, Pink Floyd, Jeff Beck, Edgar Winter, Jon Mayall … I did love the sound of guitars! More generally on topic … Yes … I wouldn’t trust Clive or seek him as an ally, but the fact that he is an enemy of progress doesn’t mean that he is wrong about Murdoch. It is useful that some not-apparently-a-lefty person is slagging Murdoch, showing sympathy for refugees and saying action on climate change is important. It’s also fun that Jacqui Lambie is calling for free tertiary education. I would say it was ‘ironic’ that not so very long ago, Clive reckoned Greens were part of a CIA plot to ruin Australian coal interests, and now he’s apparently saying coal should stay in the ground. Heh. When my sister and I discovered our older stepbrother’s TNT cassette when we 5 or 6, it was like the best thing we’d ever heard. We could sing along to it for hours 🙂 Oi oi oi oi. We were very familiar with what TNT was of course thanks to a steady diet of Road Runner cartoons growing up. It was an underage show at Moorabbin Town Hall, and those girls must be all of 14 or 15! 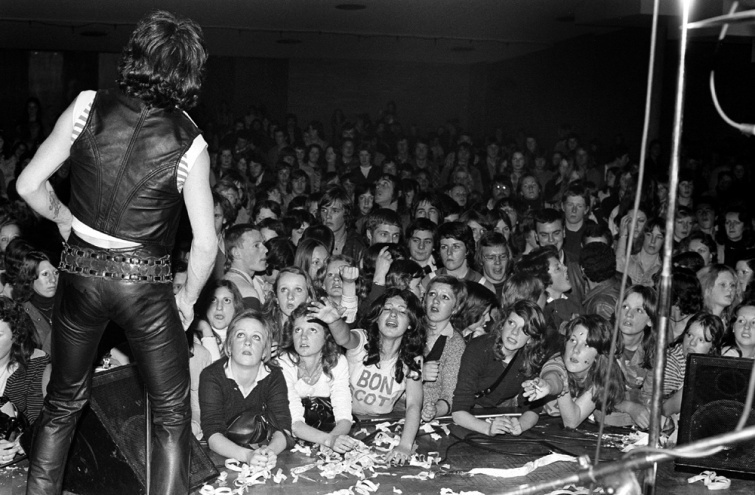 Can you imagine what those leather pants would have looked like from the front? Lenore Taylor has PM Tony Abbott pegged. That doorstep interview of 45 minutes duration yesterday, that attempt to “reset” the political slaughterhouse of the previous year or so in office, was farcical: the PM did not give one single good reason for us to believe a word he said in that Q&A session, not one; and given he has not merely broken a few promises, but absolutely shattered them, we need some pretty compelling reasons to be giving his latest ululations a considered reflection. I remember his interview before the election, when as opposition leader, he was asked if once elected, he would break his election promises should their be a change in budget circumstances (between now and after the election, now being approx three weeks before the election), and he concisely but emphatically guaranteed he wouldn’t. In other words, the then opposition leader not only made promises he didn’t keep, but he made promises about not using the budget as a reason to break other promises; he didn’t keep that promise, either. That “extra promise” makes those election promises about as unconditional, as unequivocal as you can get in politics, and he should certainly be held to account for that. PM Tony Abbott—as opposition leader at the time—compounded it by doing that segment on SBS the night before the election, making unequivocal statements like no cuts to the ABC, no cuts to SBS, among other recently cut items, you know, like health and education. Lenore Taylor is one of the very few journalists left who is willing to do hold PM Tony Abbott’s feet to the fire; the other political journalists don’t seem to have a problem with politicians essentially dissembling their way to power. As she says, PM Tony Abbott has somehow managed to snooker himself at almost every turn. Nothing is more dangerous than a politician cornered. Often you can glean something of the main political party’s views from the troll comments under MSM stories. They’re fairly easy to spot. Not just the fans of each party but the ones that scream “official party troll”. Yesterday the ABC had a story about that press conference, “The Buck Stops With Me”. It is all just about politics – basically everything that Abbott has touched has turned to gold,which is why he’s hot favourite with the bookies to win the next election. From stopping the boats and repealing the carbon tax, standing up to big corporations (Coca Cola, Ford, Qantas), international trade deals, his response to the two airline disasters, his praise from world leaders from all corners of the globe, his championing of including Aboriginal recognition in the constitution, restructuring of how shares are taxed to help Australian startups, getting agreement on closing the gap between pay rates for women and men at the G20, record spending on health and education – more than Labor ever spent. Yes, he is facing a relentless opposition and doesn’t have an alliance with the Greens in the Senate like Gillard did, but on balance, except for a few budget measures, nobody can doubt that this government has done an enormous amount of good since it came to power.